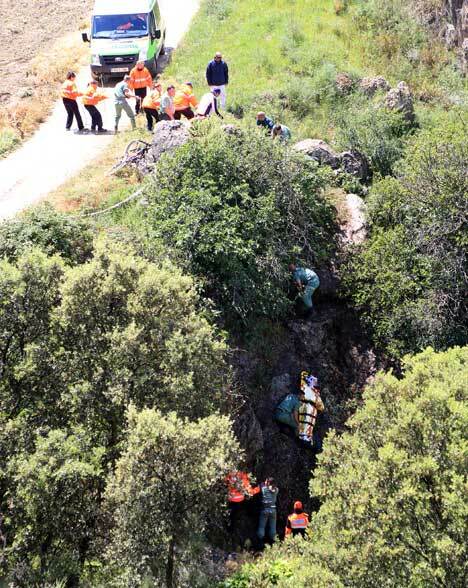 A DRAMATIC rescue operation had to be launched during Ronda’s gruelling 101 kilometre race when a cyclist fell into a chasm. 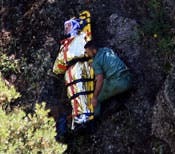 The cyclist fell six metres into the steep gorge on a tight bend beside the River Pena in Ronda la Vieja. According to the organisers, the man – who was the unlucky number 13th competitor – suffered only a badly fractured leg in the fall. He was entirely conscious during the long-drawn out rescue operation, which was hampered by bad weather. Eyewitness Adrian Day, who lives next to the gorge, said: “We were bemused by their lack of ability to get help to him quickly, and several people helping almost ended up falling in as well. The annual event, which now attracts over 5000 competitors, started in Arriate, before heading off into the nearby hills, around Setenil and Ronda la Vieja. Organised by the Spanish Foreign Legion, who are based in the town, the competitors – who can choose between cycling, walking or running – have until Sunday at 11am to finish the race. The weather couldn’t have been different from last year when many of the competitors got heat stroke. As Day added: “It was such a contrast to last year’s event when people were fainting with heat-stroke at the top of our drive.